With current electricity generation system of Mongolia totaling around 1200 MW this is a bold increase, which will have consequences for global climate, local environment, human health and country’s political and financial independence. The Mid-term Program contains many politically correct statements about reducing energy losses, promoting private energy generation, developing renewable energy, including solar-roof systems. However, it puts above all objectives the rapid development of coal-thermal power plants (CHPs) at the same time does not reflect in its budget costs for the implementation of crucial systemic measures. The Program and its budget (see Table 1) appear to be a product of lobbying by various energy firms not only from Mongolia but also from Russia and China, each securing their own line items in this highly compartmentalized and thus incoherent document. Table 1: Mongolia’s Midterm Energy Program intends to increase carbon footprint 9-fold adding over 3 billion USD to national debt. It also slows down expansion of solar and wind energy. 700 (Est.) + private invest. 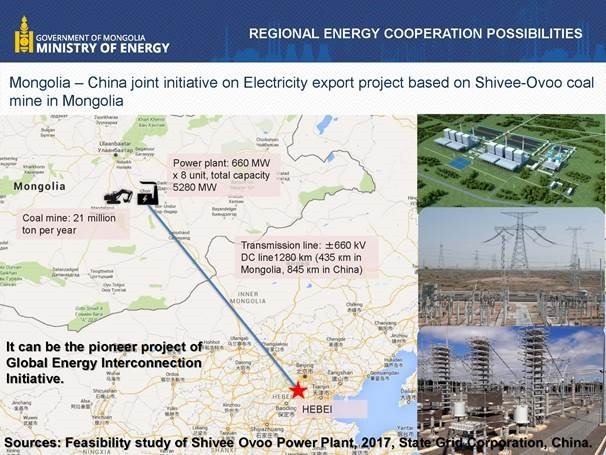 includes 30 MW of "renewables"
Main program components raise major doubts, such as the 700 MW Baganuur Coal-thermal power plant built by the China Nuclear Industry 22 Corporation for "domestic needs" or the 5800MW Shivee Ovoo coal-energy base planned by the China State-Grid Corporation solely for imports of energy from Mongolia. Recent pledges made by China’s Government to avoid negative environmental and climate impacts in its Belt and Road Initiative, especially in the context of Paris Agreement, look unconvincing if Sino-Mongolian energy cooperation will be implementing such unsustainable colonial-style projects. All non-fossil-based energy sources to be developed compose only 8% or 690 MW out of 8760 MW of planned new generation. 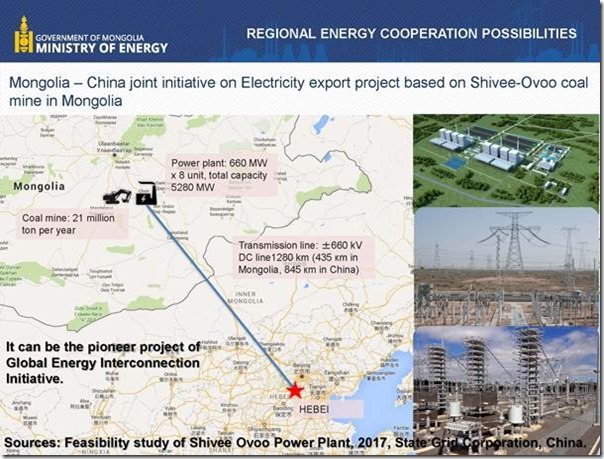 With these plans it is highly unlikely that Mongolia will fulfill its pledge (reiterated in the Program) to achieve 30% share of renewables by 2030. Mongolia will, however, achieve its 2020 promise to install 20% of renewable capacity, which will come solely from wind and solar farms and not from development of large hydropower as initially planned by Mongolian officials. Mongolia’s potential for solar and wind energy is at least 2000 greater than its hydropower and can be utilized much faster at lower cost. There is no surprise that construction of the Egiin Gol Hydropower Project planned since the early 1990s has not even started, while up to 200 MW of wind and solar parks sprang up in less than a decade. Long and often arduous planning and construction periods of hydropower projects, with installation costs well exceeding USD 2500 per kW (against USD 8000/kw for solar and 1850/kw for wind energy), resulting in extremely high environmental and social footprint as well as in tensions with the neighbors are few of many reasons of why hydropower should not be pursued on water-scarce rivers of Mongolia. Completely unabashed by all obvious positive and negative experience, the Program authors restricted to 190 MW development of renewables (using mostly private funds) and suggested to borrow at least USD 1 billion to develop 400MW of large hydropower in the same locations where it sparked controversy for last decades. Hydropower is justified by proponents as way to stabilize the whole energy system. It should be noted, that traditional hydropower is seen now as only one of possible options to add much needed maneuvering capacity to national energy system. The Program justly lists other solutions such as supply of coal-bed methane gas for gas-turbines, large battery storage, pumped-storage hydropower, improvement in transmission and dispatching, etc. However, from all those measures only high-capacity storage 100 MW battery with a price tag of USD 285 million and the ADB as the source of loan is listed in the budget, while for the rest no funding is envisioned and thus those proposals likely not to be implemented.